Saving documents in the PDF format seems more practical nowadays than printing them on paper. PDF is a standard documentary exchange format, which makes it popular for small businesses as well as large corporations. All modern text processors like Microsoft Word or OpenOffice Writer have the ability to save documents in the PDF format. But this means that you will need to open each document individually, save it as PDF, open the next document, save it as PDF again, etc. And you will have to repeat the procedure each time you need to save Word as PDF. In case you have just a few files to process, this is quite convenient, but if you have dozens of those, you probably need a different solution. Fortunately, you can automate converting Word documents to PDF using DocuFreezer software! DocuFreezer offers automatic conversion of any number of documents to PDF. Add all the documents to be converted to the list, select the output folder and click Start! Don White is absolutely right! DocuFreezer is able to convert not only Microsoft Word DOC and DOCX documents. It also can export Microsoft Excel, PowerPoint and plain text files! The documents can be converted to PDF, JPEG, TIFF and PNG formats. PDF files created by DocuFreezer are searchable and save 100% of links and layouts that the source documents contain. In case you need to convert Microsoft Excel, PowerPoint or Word to JPG, TIFF or PNG, DocuFreezer can do it for you using internal graphics engine. DocuFreezer requires Microsoft Office 2007 starting from version SP2. Microsoft Office 2010 and 2013 are aslo supported. Unfortunately, Microsoft Office Starter Edition is not supported, because it doesn’t have public API. 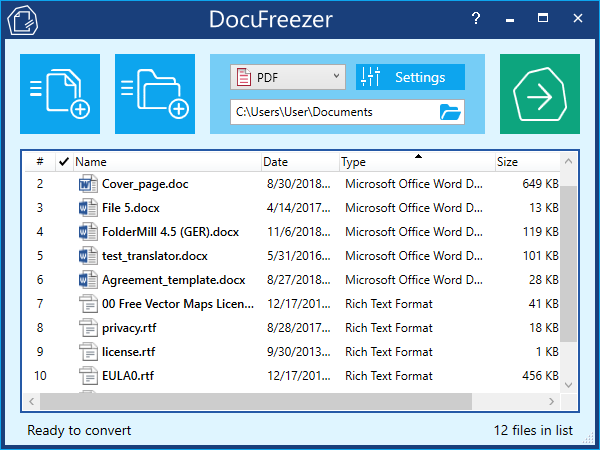 DocuFreezer 1.0 is free for personal use. Try DocuFreezer now and see how much time it can save for you!